Y al mirarte mi vida me enamoré, me enamoré. si estás enfermo de tanto amar. And by seeing you, my darling, I fell in love, I fell in love. if you are ill from so much loving. This piece of Hey Arnold! fanart is dedicated to one of my role models in reviewing and a fellow DeviantArtist who celebrated his birthday yesterday, Logan Ridenbaugh aka Hewy Toonmore from Hewy’s Animated Movie Reviews. So, with that said, Logan, I hope you had a wonderful birthday, continue to be as inspiring as you are and keep up the awesome work in everything you do as an artist and as a reviewer. There’s nothing more romantic than having two of my all-time beloved Hey Arnold OTPs, Arnold/Phoebe and Gerald/Rhonda, having an intimate moment on the balcony with the stars and the moon shining upon them. Furthermore, I aged up Arnold, Phoebe, Rhonda, and Gerald to how I would think they would look like this year. So, Arnold is 31 going on 32, Phoebe is 31, Rhonda is 31, and Gerald is 31 going on 32. Yes, I am fully aware that the Arnold/Helga, Gerald/Phoebe, Curly/Rhonda, and Harold/Rhonda shippers are going to start a lynch mob and be out for my blood because Arnold/Helga and Gerald/Phoebe are canon couples and all of that! What I say to that is, bring it on but also please hear me out. I can only tolerate Arnold/Helga and Gerald/Phoebe to a certain degree because at least these pairings have their moments. However, I find the pairings between Arnold/Phoebe and Gerald/Rhonda to be not only endearing in such a charming and cute way but also extremely plausible. So, let’s not waste any time, shall we? It should come off as no surprise that I have shipping them ever since I was eight years old. My sentiments with this couple have not changed in the slightest. There is something so awesome, plausible, and brilliant about pairing someone as intelligent, diplomatic, kind, caring, bright, and optimistic like Arnold Shortman with someone as eloquent, pragmatic, equally intelligent, brilliant, and rather cute like Phoebe Heyerdahl. Having these two exceptionally brilliant minds and souls being paired up as a couple just spells a healthy relationship and an exceptional synergy between these two. Moreover, loyalty, respect, allegiance, and unconditional love would definitely be the key factors in Arnold’s and Phoebe’s relationship. My headcanon for this couple goes something like this. Arnold and Phoebe started going out with each other in middle school after finding out for so many years that they have something more in common than they thought. With the approval of their best friends and former love interests, Helga and Gerald, Arnold and Phoebe hit it off with each other in an instant. They stayed stable as a couple all the way up to college, which is something phenomenal and, therefore, impossible to accomplish, but they did it. Whatever petty argument Arnold and Phoebe had would be easily resolved with a good talking to, finding the root problem, and making something out of a problematic situation. They attended the same college, the University of Hillwood, where Arnold majored in International Relations and History and minored in Archaeology and English and Phoebe majored in Chemistry and Medicine and minored in Physics and Mathematics. From their bachelor’s to their master’s to their doctorate’s they graduated at the top of their classes. The day after getting their doctorate’s degrees, Arnold proceeded to ask Phoebe for her hand in marriage. She then reciprocated with tears of joy flowing from her eyes. Their parents could not be any happier for their children. Miles and Stella were so proud of Arnold for having someone as brilliant and loving as Phoebe to be his wife. While Kyo and Reba were euphoric that Phoebe found someone as faithful, supportive, and kind like Arnold to be in her life in sickness and in health. Today, Arnold Shortman and Phoebe Heyerdahl-Shortman are the proud parents of four children, Philipp Jr. who is four years old, Stella Jr. and Marie who are two years old, and Craig who is one year old. Moreover, they have long-lasting careers as accredited teachers in Hillwood High, where Arnold teaches History, Political Science, and Philosophy, while Phoebe teaches Chemistry, Mathematics, and Physics. As parents, they ensure exceptional decorum for their children, lest they should end up turning into juvenile delinquents. Aside from that, they also find time to have fun with their children by going to the zoo, going to amusement parks, and even having strolls in the park. Somewhere in the back of my mind, I had the feeling this was going to end up as an item in my eyes. Sure, I still paired up Gerald with Cecile, Arnold’s French pen pal, and Rhonda with other guys like Alan Redman, Lorenzo, and/or Rex Smythe-Higgins. However, there is something about these two that make it work. It could be because they put so much emphasis on being cool. It could the fact that they are mostly donned in red as their trademark colors, thus making them more than compatible in terms of their passionate and rather fiery personalities. Or it could be because only a few people ever thought about having them as a couple through the fear of their personality clashes getting the best of them thus making their relationship short-lived. I say it’s a combination of their personalities and how much these two want the finer things in life in their special ways. Unlike Arnold’s and Phoebe’s ever-smooth and ever-endearing relationship where the two parties are diplomatic enough to talk things through and find a common solution, Gerald’s and Rhonda’s relationship plays off as fierier, more competitive, and more exciting. There would never be a dull moment between them because of how their personalities like Gerald’s swagger and Rhonda’s sassiness complement each other. Gerald would usually be the one to temper Rhonda’s occasional pompous attitude and Rhonda would be the one to keep Gerald’s philandering at bay. In spite of their clashes, they would do their best to come up with an agreement in which both Gerald and Rhonda can at least cool down and ensure that they keep to their word of solidarity. Moreover, they would feed off of each others’ yearning to do more in life with their code of being you only live once. Hence they would aim to obtain the finer things in life while also making sure that they do not forget the people most important in their lives and ensure that their relationship does not go on the rocks. In my headcanon, Gerald and Rhonda had an on-and-off relationship from middle school to high school. One day they would shout at each other and try to show off who the cooler, more popular one is and the next day they would kiss and make up. By the time they graduated high school, Gerald and Rhonda set their sights on the things they are most passionate about, fashion design, entertainment, entrepreneurship, and filmmaking. During their matriculation to the University of Hillwood, Gerald majored in business management and finance and minored in filmmaking while Rhonda majored in fashion design and acting and minored in theater. Their skills in finance, fashion, and entertainment made them all the more lauded by the deans and their colleagues to the point where Gerald and Rhonda opened up their own fashion business in which they christened it as C’est Chic. After graduating college, C’est Chic was officially booming even more. Gerald’s and Rhonda’s relationship was not only professional but it grew more intimate, especially when he proposed to her. Rhonda squealed with excitement and the press made Gerald’s and Rhonda’s wedding one of the hottest items to be sold not only on paper but also on social media. In terms of how their parents felt, Martin and Mrs. Johanssen could not be any happier that Gerald not only became a well-rounded and successful gentleman but also found someone who could be able to put up with him. 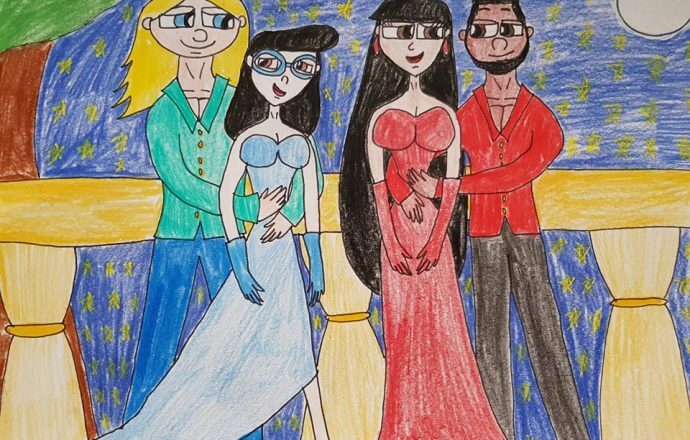 Buckley and Brooke are extremely proud of Rhonda for not only chasing her dreams but also obtaining a charming, elegant, and suave gentleman like Gerald. Today, their fashion business C’est Chic continues to boom with new ideas a-popping, more international acclaim to be obtained, and the fact that this has become a family business. Moreover, Gerald and Rhonda are the proud parents of three children, Maureen who is three years old, Kallen who is two years old, and Aretha who is ten months old. Within their business, Gerald is usually in charge of finance, logistics, and international shipping, while Rhonda is usually in charge of promotion, making deals, and checking the quality of their products. As parents, it is indeed tough for them to balance work and family. However, with the moral support of their families, they ensure that Maureen, Kallen, and Aretha have a stable family life not only through their parents but also through their paternal and maternal grandparents, paternal uncle, Jamie O, and paternal aunt, Timberly. In addition to that, Gerald and Rhonda take turns in changing their children’s diapers and preparing healthy, organic meals for the family. Phew! I think I wrote a ton on these couples. I will say that it was quite the fun ride I had, as Hey Arnold was a show I grew up with and one that has always been so close to my heart. And whether you like these couples or not just remember that these are my tastes and opinions and we all have different ones. Well, that’s it for this post. As I stated before, Hewy Toonmore, I hope you had a blessed birthday and do take care. As for the rest of you my dear viewers, have an awesome summer. 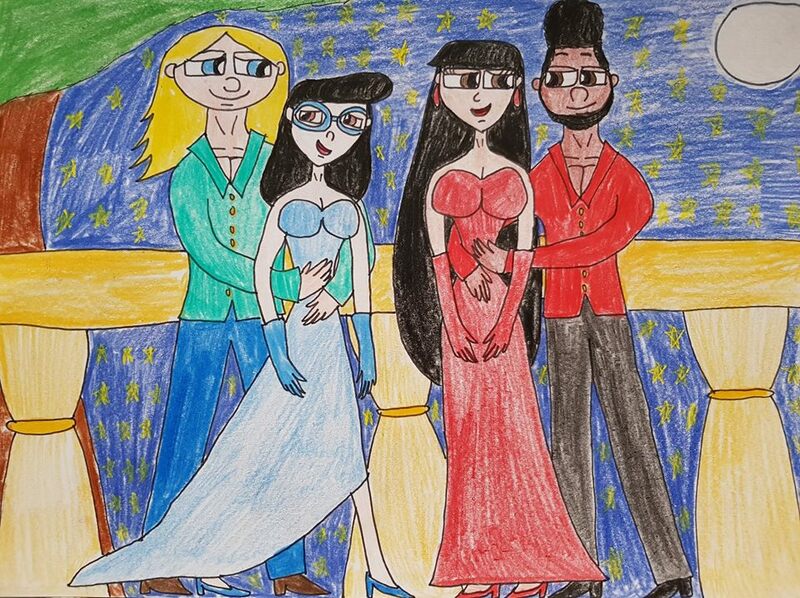 Arnold Shortman, Phoebe Heyerdahl, Rhonda Wellington Lloyd, and Gerald Johanssen from Hey Arnold belong to Craig Bartlett and Nickelodeon.